There are many women who have sacrificed everything so that they can devote all the time to look after the well being of family, friends and others. Their selfless sacrifies even under very trying times is an inspiration to many. Their struggle to maintain family dignity comes at a very high sense of responsibility. 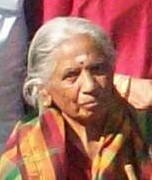 Mrs.Rukmani Bhojraj is one such Badaga woman. Daughter of a great Badaga leader from Kundhah Ketchigatty B.K.Bella Gowder and daughter in law of another great Badaga Leader Rao Bahadur Hubbathalai Ari Gowder, she has lived a life full of grit and determination, in-spite of severe physical impediments. She has been a source of strength to all those who have known her. As this ever friendly lady, steps into her 82nd birthday today, we seek her blessings and wish her many more happy returns of the day!